Undefeated warrior Jamie Conlan will face former World title challenger Yader Cardoza for the Vacant WBC International Silver Super-Flyweight Championship at the Belfast Waterfront on Saturday 18th February, live and exclusive on BoxNation. 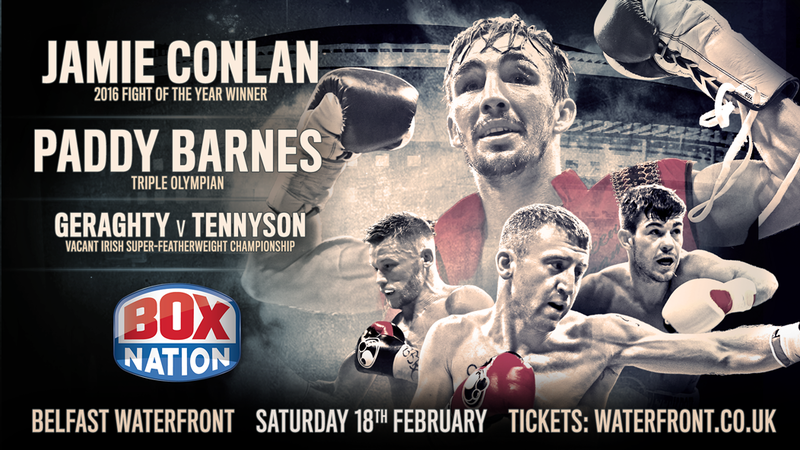 Boasting a flawless record of 18 wins, 11 via knockout, 2017 promises to be a huge year for all-action Conlan and the Belfast man is determined to add another belt to his growing collection in front of his home crowd before targeting a World title shot later in the year. ‘The Mexican’ knows he will have to come in at his best against Nicaraguan Cardoza, who challenged Adrian Hernandez for the WBC World Light-Flyweight title back in 2013. Cardoza boasts an impressive record of 21 wins from 32 career fights, six coming via knockout, and is determined to spoil the party on February 18. “Expect fireworks”, declared Conlan. “This is a great opportunity to get my hands on another belt and I’m not going to waste it. Cardoza has fought at World level but that belt has my name on it and I’m going to send my fans home happy. Elsewhere on the card Irish amateur favourite Paddy Barnes fights for the second time as a professional after winning by a bizarre disqualification on his debut and is promising more fireworks on February 18. Plenty of pride is at stake when Dublin’s Declan ‘Pretty Boy’ Geraghty takes on Belfast’s James ‘The Assassin’ Tennyson for the Irish Super-Featherweight title in what promises to be a fight of the night contender. Tyrone McKenna defends his BUI Celtic Super-Lightweight title against Jake Hanney in the evening’s second Belfast vs. Dublin clash. McKenna stopped fierce rival Sean Creagh last time out at the Titanic Exhibition Centre and is aiming to take another unbeaten record when he faces Hanney. Unbeaten Flyweight Kevin Satchell fights for the first time since his win over Brett Fidoe back in June 2016. Satchell has followed the traditional route, picking up the British, Commonwealth and European titles and is now on the verge of major title opportunities later in the year. Local Light-Heavyweight talent Steven Ward aims to improve his unbeaten record to 3-0; Dublin Super-Lightweight Philip Sutcliffe Jnr is hot on the comeback trail after his all-out war with Chris Jenkins last time out in Belfast; exciting Team Fury Heavyweight prospect Con Sheehan is aims to start the year in style and amateur Welterweight standout Lewis Crocker makes his highly-anticipated professional debut in his home city.